Snow Cone Machine Rentals For The Dallas / Fort Worth Metroplex. Kids Love Snow Cones! 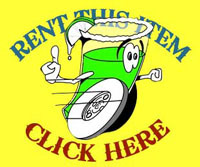 Dropped off Friday & picked up SundayIf your ready to rent a snow cone machine, we can help. If your sno cone machine is a party rental for a Friday or a Saturday, we will deliver the sno cone maker on Friday morning and pick it up Sunday morning.